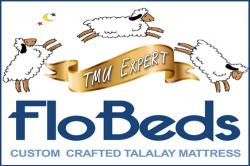 Flobeds is one of the original pioneer manufacturers of component latex mattresses boasting nearly 40 years in the bedding industry and making high-quality personally crafted latex mattresses of unique designs. With customizable cores and a “vZone” (5 zones) layer option, it is easy to find just the right combination for each sleeper. They also have a Goldilocks Guarantee where you can continue to make changes to your mattress as your body changes over time. They are a certified B-Corp using premium organic materials with mattresses made in their manufacturing facility in Fort Bragg, Northern California and sold worldwide. They have more than 20 years experience selling online and being able to recommend the right mattress to people who have not had the advantage of laying on them to test the product for compatibility. They are very knowledgeable and take great care of their customers with attention to detail and customer service. They also make a line of latex/memory foam mattresses and some premium mattresses that include some less commonly seen materials including coir and horsehair. 3" vZone Layer: Talalay zones to provide targeted pressure relief. 3" Talalay latex Soft, Medium, Firm, X-Firm or SuperFirm. The perfect support for a Latex Mattress. If you order by phone please mention The Mattress Underground at the time of purchase to get your discount. Retail Presence: Their showroom is in Fort Bragg, California where all the systems are made. Create an account to ask any questions you might have.